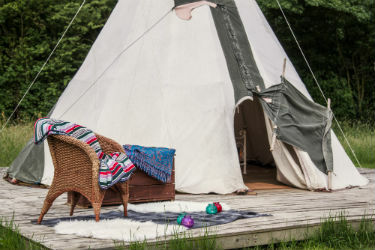 Camp Kátur is a Glamping experience in Yorkshire with a difference. Set within the beautiful 250 acre Camp Hill Manor Estate of North Yorkshire and close to many popular tourist attractions and local historic Market Towns such as Bedale, Masham and Ripon, the stunning Spa town of Harrogate and great Cities of York, Leeds and Newcastle. 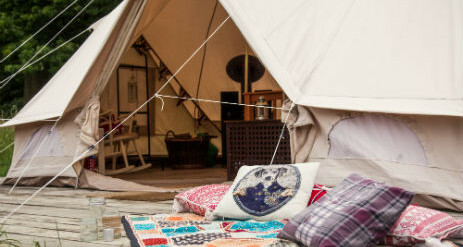 Camp Kátur is known as the home of outdoor adventure, offering a truly memorable Yorkshire Glamping holiday. Camp Kátur Glamping Village includes Safari Tents, Tipi, Bell Tents, Hobbit Pods, Hobbit Hide, Geodomes, Unidomes, Betty our 1980’s Retro Caravan and new for 2018 Bear Place Lodge, nestled amongst breathtaking meadow and woodland, it’s a retreat with a cocktail mix of fun, relaxation, tranquillity and adventure. It is a place that is special to families, couples and groups of friends who want to experience back to basics way of living and quality time with one another whilst discovering true outdoor happiness. Whether it’s total relaxation you want or a fun packed weekend of adventure and activities Camp Katur has it all without having to drive anywhere. The Camp Hill Estate offers a wide range of activities and team building adventure days whether you are solo or in a large group there is something to suit everyone. Our Bell tents Emperor and Tinker Bell have a maximum occupancy of 5 in each tent with 1 double bed, 1 double sofa bed and 1 single sofa/Z bed. These light and airy canvas Bells are perfect for relaxing days sat by the log fire overlooking the beautiful green Meadow. 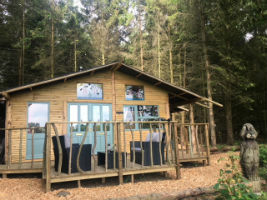 Hobbit Hide sleeps 2 people and comes with a double bed, gas fire, outside decking area with BBQ , Fire Basket and Bistro Seating. As the name suggests these Pods are, by their very nature, small spaces which no matter what the weather is doing stay comfortable and cosy. 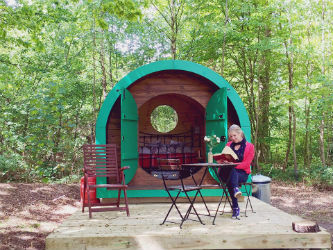 Our friends and family hobbit pods are the luxury alternative to a four man tent and consist of a bunk bed, single futon ZIP chair and a seating area which also doubles as a single bed. Drogo Bulge, Prisca Foxburr and Lila Bracegirdle are nestled within a lovely woodland setting facing out towards the large Meadow on the West side of the Glamping Village, all furnished to the same spec. 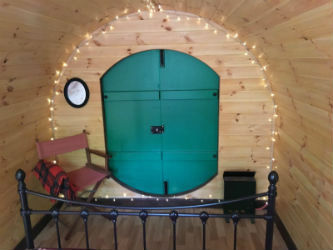 A cosy Romantic wooden Hobbit Pod for two nestled within beautiful Woodland facing out towards the green Meadow, dressed with lots candles and fairy lights. A double bed with bedding is included. Romeo and Juliet is the perfect surprise getaway for a loved one. Practical and aesthetically pleasing space for 21st century living. Influenced by the dwellings of pioneers and nomadic tribes around the world, Unidome is the fruition of the fusion of the past colliding with the future and the realisation of a lifelong passion. The Meadow Hide Unidome is situated on the South side of the Meadow in between two beautiful large Oak Trees, perfectly suited to its Oaked panels! Sleeping up to 3 guests it leaves plenty of space for a lounging area. 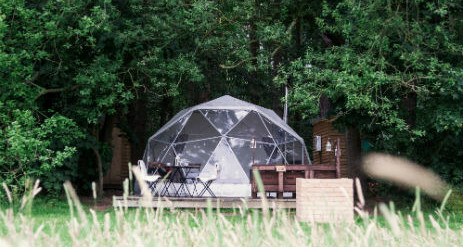 Hidden in the woods this new and truly unique Dome (which we are the first to have) is a 360 degree clear panoramic Dome with stunning woodland views all around, its the ultimate relaxation space enabling you to stargaze under the duvet and wake up in the wilderness. For those looking for something truly different this is the one to try. Today Teepees are more commonly made using canvas, not animal skins! Our Teepee sleeps 4. 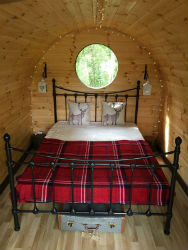 Our 2 new luxury Geodomes which can sleep up to 4 in each. Both Geodomes have their own private bathroom with hot gas shower, and a kitchenette area with all the essentials required for cooking and making a brew! 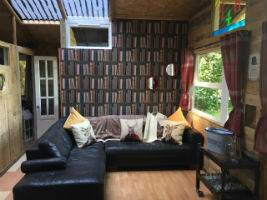 Bears Place Lodge is a characterful higgledy piggledy lodge situated just off our glamping meadow, which has been made using 70% upcycled, restorative, sustainable materials making it extremely unique and green friendly. 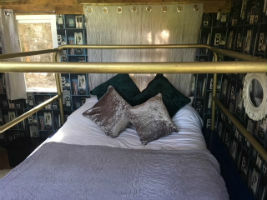 It contains a restored horse box bedroom which is the centre piece to the lodge creating a unique and magical bedroom for children to enjoy. The lodge sleeps up to 4 guests, in 2 bedrooms and comes with its own outdoor campfire cooking area for guests to enjoy cooking up their camp fire treats. 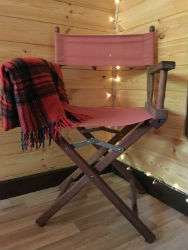 Please remember Glamping is still camping and we advise that all guests bring suitable warm clothing, footwear, woolly hats, sleeping bags, torches and lanterns. Extra logs, fire lighters, candles and charcoal can be purchased on-site at Reception. The Glamping Village accommodation is “off the grid” meaning no electricity! Where possible we power what we can by Solar the main source of lighting is by torch light and candlelight and the main source of heating is log burning stoves and gas heaters. Around the Estate there is a whole host of facilities already available to our guests with mains electricity, toilets and shower block just 8 minutes walk away next to the Orangery Cafe should you find yourself desperate for some of the more conventional luxurious! As we are located in what we call a “big playground”, there really is no need to venture offsite! Camp Katur at Camp Hill offers a huge range of onsite activities and adventures for all ages and thrill seekers! Whether you are staying for two days, a week or a fortnight, the list is endless but dont forget to find time to relax! The Café is open at weekends and daily during school holidays only, serving a delicious selection of hot and cold snacks. It is situated conveniently on the way into the Estate next to the main Reception, so be sure to stop by when you arrive. Open from 10am until 5pm serving lunch time snacks and delicious home made cakes, hot and cold drinks. Thanks to our healthy food policy everything served is either produced on-site or sourced locally. 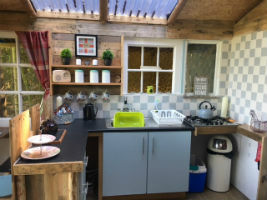 The Safari Tent Café is owned and operated by Camphill Ltd and have their own opening times; this is a separate independent business to Camp Kátur who provide glamping accommodation. 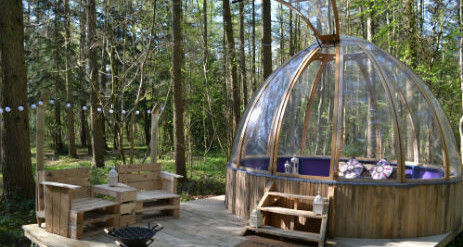 Why not treat yourself to some “me” time at our very own outdoor Eco spa, this is truly an experience not to miss and will have you well on your way to discovering your outdoor happiness. Set on the edge of a tranquil woodland south facing our outdoor Eco Spa enables you to sink into total relaxation with a wood burning hot tub it is the perfect place to unwind, whilst listening to the sounds of local wildlife during sundown. Help soothe away aches and pains from your day’s activities in the wood burning barrelled sauna, don’t forget to take a cold shower beforehand to feel the full benefits of heat sizzling through your muscles. Pre order a bottle of chilled Champagne, borrow one of our musical instruments from the music den, light the surrounding candles and let the fairy lights twinkle for an evening of bliss. Originating from Lapland called ‘Grillikota’ in Finnish, Nordic BBQ cabins are the perfect indoor Barbequing solution for our lovely British weather! It’s the perfect space for all occasions 365 days of the year, with a perfect blend of BBQ comfort and the great British outdoors. Come rain or shine our BBQ Grill Cabins are the perfect place to dine with friends and family. The BBQ cabin comfortably seats up to 15 adults and includes cooking utensils, one bag of charcoal, box of matches, paper plates and plastic cutlery are supplied in the BBQ Grill fee. BBQ meat and Fondue Dessert Hampers can be pre-ordered at an additional cost. 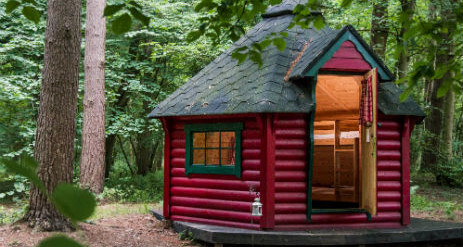 Don’t forget to add the BBQ Grill Cabin when booking your accommodation! Whether you are looking for a fun packed activity weekend with great friends, outdoor adventures, a winning day at the races or just a relaxed weekend exploring the North Yorkshire countryside with fine wine, tasty food and cosy accommodation Camp Kátur offers it all! Weekends and activities include Bush craft, Cooking workshops, Yoga retreat weekends, Boot camps, Wine tasting, Cupcake decorating, Craft workshops, Pamper sessions, Life drawing classes, Cocktail making classes and Burlesque workshops. Woodland Ceremonies and Wedding packages also available catering up to 200 guests and accommodating 130. Sorry we do not cater for Stag or Hen Party Groups. 1. Stay 3 nights or more midweek, off peak, and get 15% off your stay. 2. 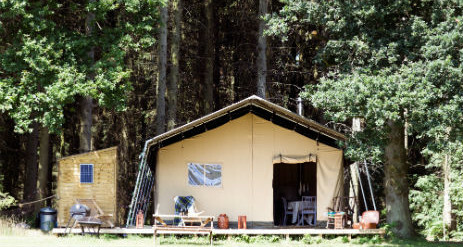 Book a Safari Tent or Geodome for 4 nights or more midweek, and receive a free Eco Spa session and 3 free complimentary bag of logs. 3. NHS, Students, Emergency Services and Armed Forces receive 10% Off Midweek off peak stays for 2 nights or more. 4. Book 4 nights midweek off peak and receive the 5th night free. 5. Couples midweek retreat. 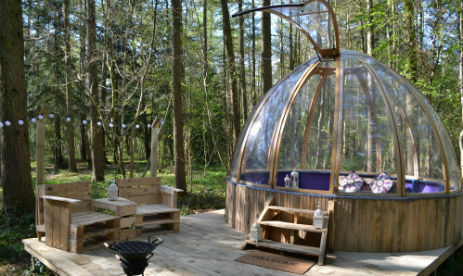 A romantic midweek off peak stay for two in Betty, Romeo and Juliet Pod, Hobbit Hide or Meadow Hide Unidome for 2 nights of more and receive a free 1 hour sauna session and a box of chocolates on your bed on arrival.